Learn about Arduino's MKR family of IoT dev boards and compare them to boards from Adafruit and Particle. The Arduino MKR family was created for makers and engineers to quickly prototype IoT projects. 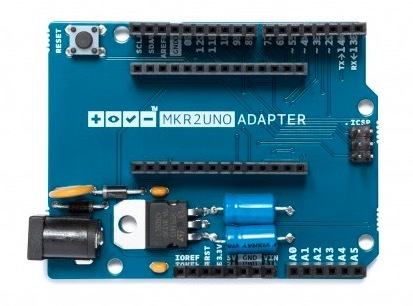 What sets the MKR boards apart from other Arduino boards is the 67.64 × 25mm MKR family form factor, the integrated connectivity in most of them, and the potential for projects of varying levels. With one exception, the MKR boards come with on-board connectivity modules ranging from Wi-Fi to GSM. Other boards support Narrowband IoT, Lo-Ra connectivity, and SigFox networking(in Europe) while shields can be added to create Ethernet and CAN (controller area network) connected projects. The MKR1000 Wi-Fi board. Photo courtesy of Arduino. Compared to the Arduino Uno’s familiar form factor, MKR boards are much smaller. However, the standard relay, memory, and prototyping shields are available, along with some more advanced shields. The MKR 485 shield allows users to transmit information with their boards using RS-485 serial communication protocol. The Arduino MKR 485 shield. Photo courtesy of Arduino. Another family member worth noting is the MKR2UNO adapter. This adapter allows the MKR1000 (without headers) to support backward compatibility with some of the Arduino Uno’s shields. The MKR1000 is simply snapped onto the MKR2UNO adapter and its pins are extended to fit the standard Uno layout. The MKR2UNO adapter allows you to use Uno shields with the MKR1000 board. Photo courtesy of Arduino. Currently, the only MKR board without built-in connectivity is the MKR Zero. The Zero is similar to the Arduino Uno-sized Arduino Zero, but with the smaller MKR family form factor. The MKR Zero. Photo courtesy of Arduino. Another oddity in the family is the MKR Vidor 4000, the first Arduino board to feature an FPGA chip. The MKR Vidor 4000. Photo courtesy of Arduino. Because of their enhanced capabilities, both the MKR Zero and Vidor 4000 backward for more advanced Arduino users. The MKR Zero, for example, is useful for audio projects with its integrated I2C bus and miniSD card slot, while the Vidor boasts high-speed audio and video processing. Other projects that take advantage of the MKR boards’ compact size and powerful chips include robotics and wearable technology. Although the MKR family includes different boards and shields, there are many similarly sized and capable boards available for different kinds of users. 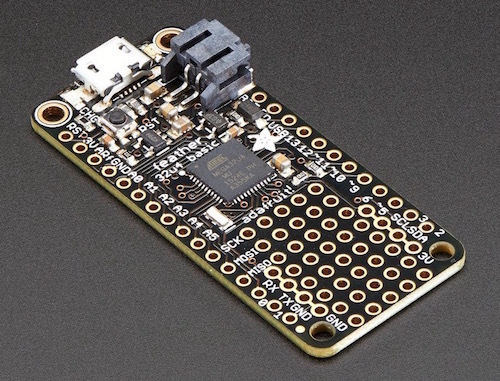 Adafruit’s Feather boards backward at makers of varying levels. Different Feather boards support prototyping, memory expansions, WiFi, and Lo-Ra radio connectivity. The Adafruit Feather 32u4 Basic Proto. Photo courtesy of Adafruit. 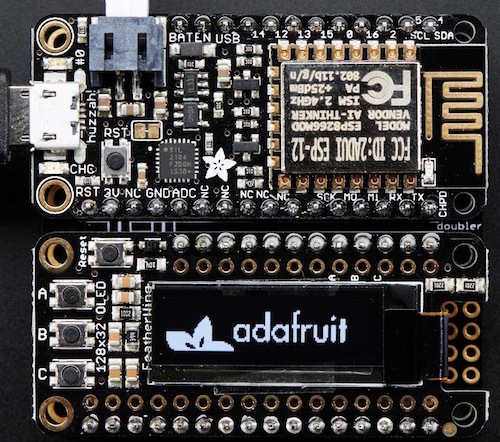 Unlike the MKR line, however, Adafruit also provides support for different radio frequencies, Bluetooth, and a larger variety of shields called FeatherWings. Every FeatherWing shield is stackable, adding ethernet connectivity, relays, audio amplifiers, displays, GPS modules, and many other features the official MKR boards and shields do not yet support. The Featherwing OLED add-on connected to the Feather Huzzah! board. Photo courtesy of Adafruit. Feather boards are also open source, allowing makers to find additional hardware inspiration. For users looking to deploy products, boards from Particle may be a better fit. The Photon and Electron, for example, are smaller boards with capabilities and a price similar to the MKR Wi-Fi 1000/1010 and the MKR GSM. The Photon board. Photo courtesy of Particle. 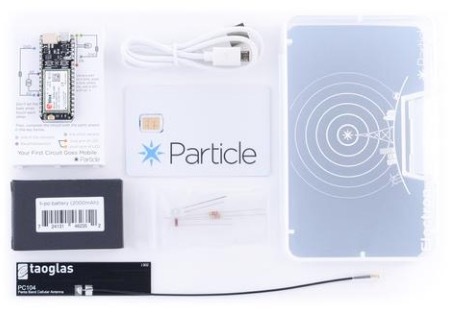 The Electron 3G kit. Photo courtesy of Particle. Although Particle products are aimed more towards industrial applications instead of hobbyist projects, there is still healthy support for the latter. Particle products also have access to Particle’s cloud infrastructure and plenty of other online tools enabling users to manage fleets of IoT devices. 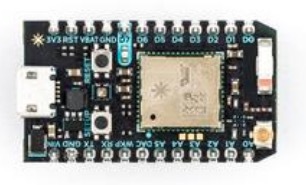 Particle offers a few shields, including the Shield Shield, which allows users to utilize Arduino shields and accessories, and some boards are compatible with Adafruit's FeatherWing shields. Small form factor IoT development boards are proof of the gaining popularity, and oftentimes necessity, of projects that utilize the cloud. Using the right boards, shields, and add-ons enables makers to create powerful, connected projects. With a little research, options for makers of varying experience as well as prototyping engineers can be found. Cover image courtesy of Arduino.